The Puente Hills is surrounded by roughly 25 perimeter miles of urban edge, nearly all of which consists of residential development. This presents challenges to both the plants and animals living within the natural areas, as well as to the people living in communities adjacent to the Puente Hills. Plants and animals living within natural areas are subject to impacts by “edge effects” from the surrounding urban areas, as well as from authorized recreational activities and unauthorized access to the natural areas. On the urban side of the urban/wildland interface, people may experience visits from wildlife. Co-existence between humans and wildlife is the key to living near and preserving this unique area. For those residents that do not live near the hills, co-existence is also the key as much wildlife live exclusively in the urban areas and cities as well. More information about hazing/scaring coyotes, please see below. Living in harmony with your wild neighbors helps to soften the urban influence on the wildlife that lives in the adjacent natural areas as well as within developed areas. With increasing urban development and consequently diminishing native habitat, wildlife are losing places to roam, forage and peacefully exist. Healthy wildlife populations are necessary for healthy ecosystems, which in turn create cleaner air and watersheds, among many other benefits. “Living on the Urban Edge: The Coexistence of People and Wildlife” is available at the Central Whittier Library on Washington Avenue at Mar Vista Street (in Uptown Whittier), or by contacting us for a free copy of the DVD. People living adjacent to or in the vicinity of natural areas will commonly receive unexpected visits from wildlife seeking food, water, and/or shelter. The smaller wildlife, such as rodents, raccoons, and skunks often go unnoticed; whereas larger mammals such as coyotes often draw the attention of humans. 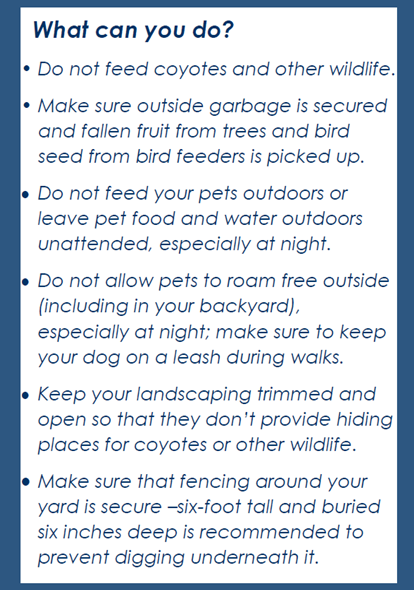 Regardless, the presence of unwanted wildlife in urban yards is usually due to one or more factors knowingly and unknowingly caused by residents. Install outdoor lights triggered by motion sensors to frighten away wildlife at night. Coyotes play an import ant role in the ecosystem, helping to keep populations of rodents and other small mammals under control. This benefits our song bird populations. Additionally they feed on raccoons, birds, insects, berries, fruits/vegetables, human garbage, outdoor pet food and small pets left unprotected. Thus, coyotes are one of the most adaptable animals, occurring in every habitat type (including urban areas) throughout North America. When residents living in communities surrounding natural areas (such as the Puente Hills) get coyotes in their neighborhoods, their first thought typically is that the coyotes are “coming down from the hills”. Although many coyotes do enter suburban areas from natural areas looking for food, many coyotes found in suburban areas are year-round residents, including very urban neighborhoods with essentially no natural areas. 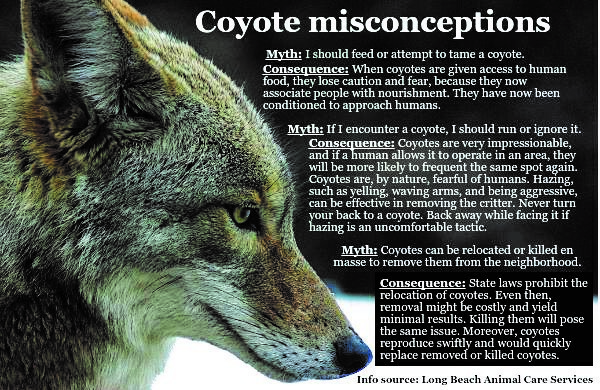 Through the illegal feeding of coyotes, and/or lack of deterrent measures to discourage coyotes from entering residential areas, humans find coyotes amongst them. Coyotes naturally are found where the food is, and if attractants (like outside pet food and water, rodents, or free roaming house cats) are present, coyotes may be present as well. Coyotes are not the serious threat that some people make them out to be since attacks on humans are very rare. It is when coyotes become accustomed to humans that they lose their shyness and can become more demanding. 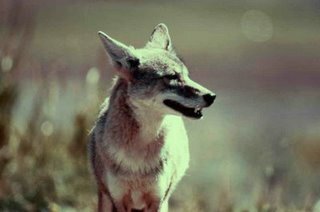 Eliminating coyotes by lethal means only perpetuates the population as coyote reproduction will increase to “make-up” for the lost individual, oftentimes resulting in more coyotes than before. Coyotes are most active and visible, potentially causing more interactions with people and pets, during mating season (January– March) and during pup-rearing season (May – July). Make noise and make yourself seem even bigger. (Click for Coyote Hazing tips.) An average adult coyote is about 35 pounds and will be intimidated by people. While they may stop and observe, they will eventually run. When you’re walking your dog, keep them on a short leash. Coyotes cannot distinguish between a small pet and their prey. Cats should not be left outdoors alone. 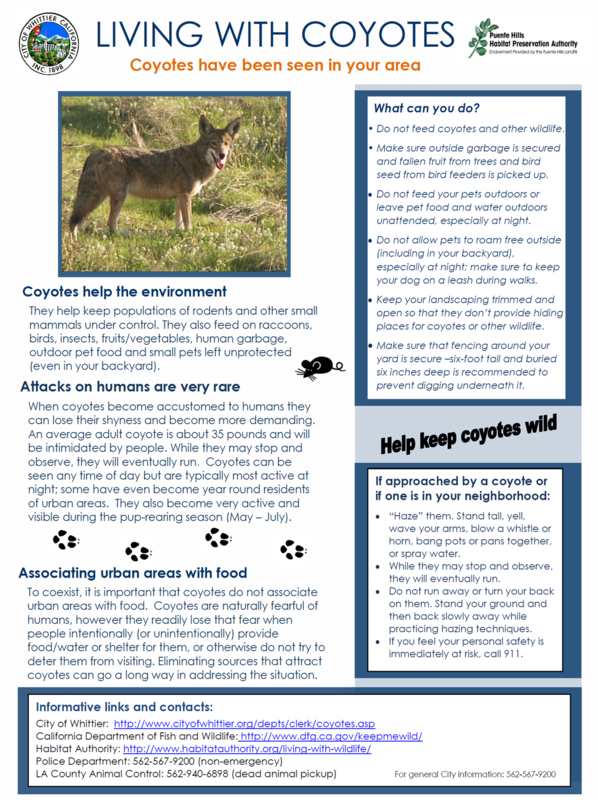 For more information on coyotes please see the above tips on Wildlife Encounters, please read this brochure provided by the California Department of Fish and Wildlife, read our blog post about Coyote Visits, visit Project Coyote‘s website or visit the National Parks Service website and learn about their ongoing urban coyote study. 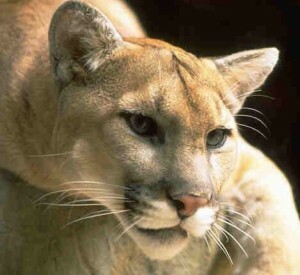 For more information on mountain lions, please read this brochure provided by the California Department of Fish and Wildlife. Edge effects (or indirect impacts) are impacts associated with urban activity. Examples of “edge effect” impacts are the invasion of non-native plant species into natural areas (generally from yard landscaping); attracting wildlife with food or backyard conditions; predation and disease by domestic companion animals; residential night lighting spilling over into the natural areas; ambient noise levels increased within the natural areas; and habitat fragmentation caused by volunteer (privately made) trails.